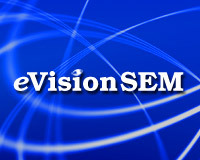 Delivering More Business Since 1998. eVisionSEM increases targeted traffic to a web and improves the site's ability to convert those visitors into leads and sales. More Traffic & More Conversions = More Business! Today, Social Media (such as Facebook, twitter, blogs etc) should be an integral part of a businesses' marketing plan. Participating in Social Media can help increase brand awareness and deliver more traffic to your web site which can develop into more business. Links and mentions developed by participating in social media may help improve search engine results too. However the implementation of Social Media can be very time consuming, so eVisionSEM has a service to help our client's with this. Our Social Media Strategist will spend up to about 10 hours a month on Social Media for you. She will start by determining your specific set of objectives for the campaign. Once those are set, she will create a plan of action that will be used as a blue print in moving forward. Once the objectives are determined and the plan of action is created, she will begin to roll out the initiatives. The initiatives may include broader online marketing tasks as we roll out such as referral site development, article marketing, publicity, ideas for new site content and digital assets, etc (read more here). helping you increase business with Social Media!